Maria Paula Arias was part of our team of bursary-funded volunteers who helped make the Museums+Tech 2018 conference possible. In this article, Maria picks out two presentations from the day – by Matt Locke and Jon Pratty – and reflects on the conference’s themes of the ‘collaborative museum’. 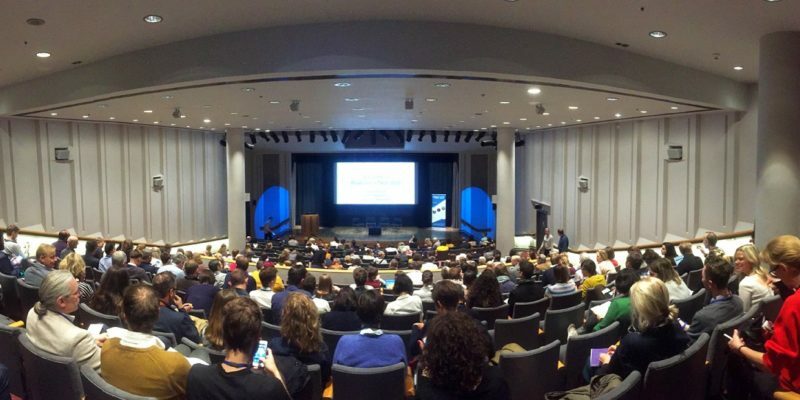 On October 19th 2018 I had the pleasure of attending the MCG Museums+Tech 2018 conference, hosted by the National Gallery in London. More specifically, I had the opportunity to attend as a volunteer with the responsibility of RTing delegates and participants’ Twitter comments. I soon found myself quite busy as the audience was really engaged, so much so that at one point the conference hashtag (#musetech18) was the second trending hashtag in London that day. 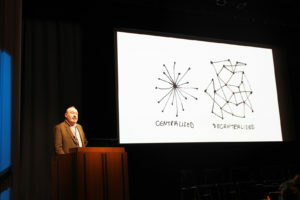 The theme of the conference was ‘the collaborative museum’ and it was central in every presentation throughout the day — from a variety of perspectives that is rarely found in ‘under one roof’. As this is a short blog post (and with apologies to the rest of the brilliant presenters) I would like to focus on two presentations that I am still thinking about and that will continue to shape my own research: Matt Locke’s keynote titled “Rhythm, Attention, Collaboration” and Jon Pratty’s presentation titled “Doing us the Power of Good? Ethics, sustainability, and continuing GLAM reliance on Google and Facebook”. Matt Locke’s keynote had a resounding effect as his discussion of rhythm resonated in every following presentation. It is as if we were all looking for that je ne sais quoi concept that captured the ebb and flow in collaborative projects, when sometimes one partner ebbs whilst the other flows. In Matt’s words “rhythm is the deeper structure that defines how work gets done” (2018), which in itself is defined by factors outside of the institution such as the industry and technologies used. Meaning that how work gets done is in one way or another pre-determined by the industry in which we work in (and its history and actors that shaped it) and the tools we use (whether digital or analogue). The concept of rhythm and its deep embeddedness in museological practice (and in academia) still rings in my mind as I continue my own research. Mostly I wonder if it is a true generalisation that “it takes a newcomer with no ties to existing traditions and supply chains to change the rhythms of an industrial sector” (Locke, 2018). Can’t old dogs learn new tricks? I would argue that not all newcomers can change the rhythms of an industrial sector, instead I would say that only newcomers that are empowered to instigate change are successful at affecting the existing rhythms of an organisation or sector. I would also say that small (maybe even subversive) actions championed by existing and embedded actors can lead to changes in how work gets done. Unfortunately, I don’t have examples to back these arguments up and would welcome a continued conversation about these concepts through the MCG discussion list or on Twitter. The second presentation that deeply resonated with me and my current research was Jon Pratty’s presentation titled: “Doing us the Power of Good? Ethics, sustainability, and continuing GLAM reliance on Google and Facebook”. In this presentation Jon reflected on the different technologies that arts organisations and academic institutions use that are based on and rely on audience data; tools that are built into content and operational strategies. This reflection is an example of how we might consider the way technologically-defined rhythms may disrupt organisational rhythms. Recently, Flickr announced a change in their operations where free accounts will be limited to 1,000 images and that “after February 5, 2019, free accounts that contain over 1,000 photos or videos will have content actively deleted — starting from oldest to newest date uploaded — to meet the new limit” (Flickr, 2018). Imagine how many arts organisations rely on this platform to engage with audiences and to provide a space where user generated images converge with institutional narratives — imagine how much of this collective effort will be lost as Flickr changes their working rhythm. Here then, the question around ethics of using digital platforms (and digital media) takes a turn from ‘should we be using a tool whose business model depends on the trading of audience data?’ to ‘should we be using a tool that could potentially erase thousands of collective creative production, of user generated cultural objects?’. If these institutions cannot rely on platforms and similar digital tools (hello Instagram!) should they be then providing in-house alternatives for users? Could GLAM institutions effectively provide spaces where users have the capacity to be information creators, owners, and contributors? I don’t have the answers and I doubt any one individual does, especially when there is not a ‘best practice’ for the use of digital media and digital platforms in GLAM organisations, academic institutions, or in research. Instead, like Jon, I am hopeful that with continued dialogue we may be able to arrive at a set of guidelines or principles in how we can be ethically mindful when using, collecting, archiving, and engaging with digital media. My research looks at the potential influence of social media platforms and social media users in the brands of museums and galleries, so you can imagine how these conversations around rhythms and ethics are particularly relevant and timely. In particular I am looking forward to seeing how these conversations may shape the relationships between museums and galleries and their online audiences. More specifically, I wonder if a change in operational and technological rhythms will result in a reconsideration of who are decision-makers (and why), who are information and capital creators and owners, and what role can museums and galleries play in these rhythm reconfigurations. These institutions may not be newcomers, but they can lead the way towards a more innovative, collaborative, and ethically mindful sector. Flickr (2018) Let’s be candid. Available from: https://www.flickr.com/lookingahead (Accessed 13 November 2018). Locke, M. (2018) ‘Rhythm, Attention, Collaboration’, in 29 October 2018 National Gallery, London. Available from: http://www.museumscomputergroup.org.uk/events/museumstech2018/ (Accessed 13 November 2018).